The mangosteen plant is an evergreen tree that can reach up to 60ft in height. Found commonly in the tropical rainforests of Malaysia, Thailand, Indonesia and the Phillippines the fresh purple fruits are considered the finest tasting fruit in the world. 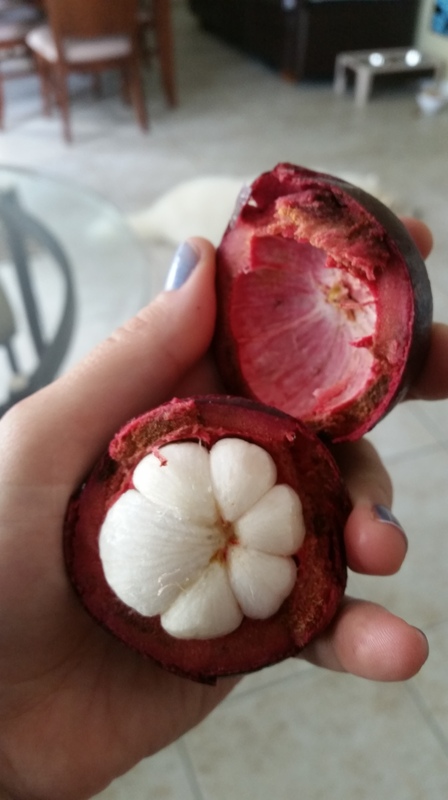 The Mangosteen fruit itself has sweet and juicy snow-white segments inside a thick purple rind. I was able to purchase some fresh ones at my local international market. 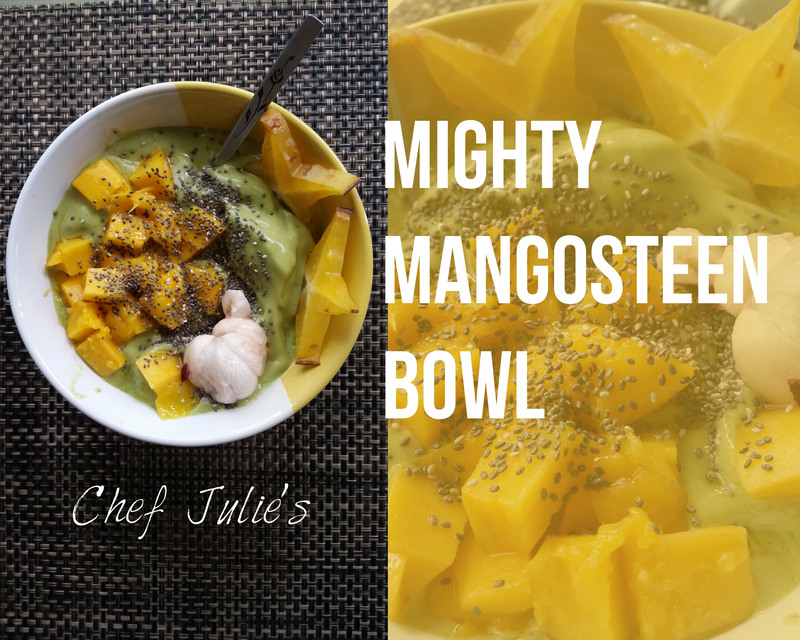 I decided to make a superfood bowl with mangosteen, kale & Banana, as the Mangosteen pulp yields a sweet/tart flavor- it goes perfectly with just about any fruit! 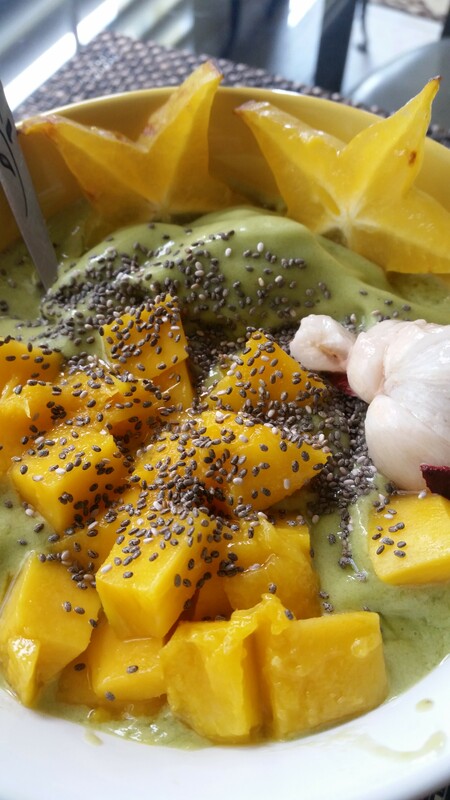 Here’s what you’ll need- you just need to blend it and finish it off with your favorite toppings! Here are some of the Health Benefits of Mangosteen- another reason to love this Queen Fruit! Anti-cancer properties: Health benefits of mangosteen include anti-cancer properties. The pericarps of mangosteen contain xanthones which exhibit anti-cancer, anti-inflammatory and anti-bacterial effects. The xanthones inhibit the cell growth in human colon cancer and as per a research study notes they exhibit the potential to be developed as agents to prevent cancer or can be used in combination with anti-cancer drugs for beneficial effects. Anti-inflammatory properties: Mangosteen has been used as an anti-inflammatory agent since many years in Southeast Asian countries. Scientific research study also showed that the extracts of mangosteen have anti-allergy and anti-inflammatory properties and they inhibit the release of histamine and prostaglandin which are associated with inflammation in the human body. Healthy skin: Mangosteen helps in maintaining healthy skin. The anti-inflammatory, anti-bacterial, anti-fungal, anti-allergy and anti-oxidant properties help in reducing the risk of various conditions such as skin inflammation, skin aging, eczema, allergies and bacterial infections. Research studies have been carried out to ascertain the various benefits of mangosteen for skin and one such study suggests that mangosteen has anti-skin cancer properties and has the potential of being an anti-skin cancer agent. Healthy immune system: Mangosteen is rich in various nutrients, minerals, vitamins and xanthone which help in boosting the immune system. These nutrients protect the body from various health ailments that weaken the immune system. Antioxidant properties: Mangosteen is among the fruits that are known to contain powerful antioxidants that are useful to the immune system and the entire body. These antioxidants contain cell boosters that are referred to as xanthones which contain various properties that have medicinal value. This is why mangosteen is termed as a healing fruit which can be used to reverse to the effects of diseases that are associated with common man. 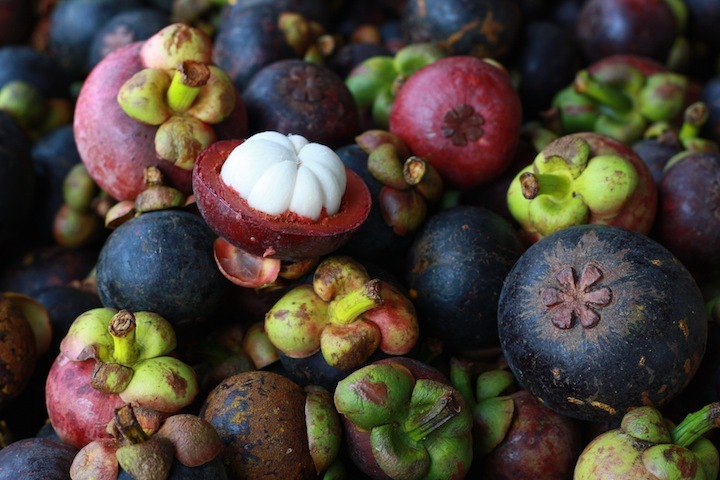 Medicinal use: Mangosteen with its anti-bacterial and anti-inflammatory properties is beneficial as a medicinal drink and for quick healing of wounds. The leaves and bark of the tree can be mixed with other medicinal herbs and applied to the wounds for a faster recovery. The medicinal drink can be prepared by boiling the leaves and the bark of the tree. Diarrhea and dysentery: Use of mangosteen is beneficial in stomach disorders as well. The mangosteen pericarp and peel are effective in providing relief from stomach disorders such as diarrhea and dysentery. Menstrual problems: The roots of mangosteen also provide health benefits. Mangosteen root helps in regulating menstrual cycle in women. Astringent properties: The bark and leaves of the mangosteen tree exhibit astringent properties and are beneficial in curing thrush or aphtha. Cardioprotective effect: Mangosteen may also be helpful in reducing risk of stroke or myocardial infarction. 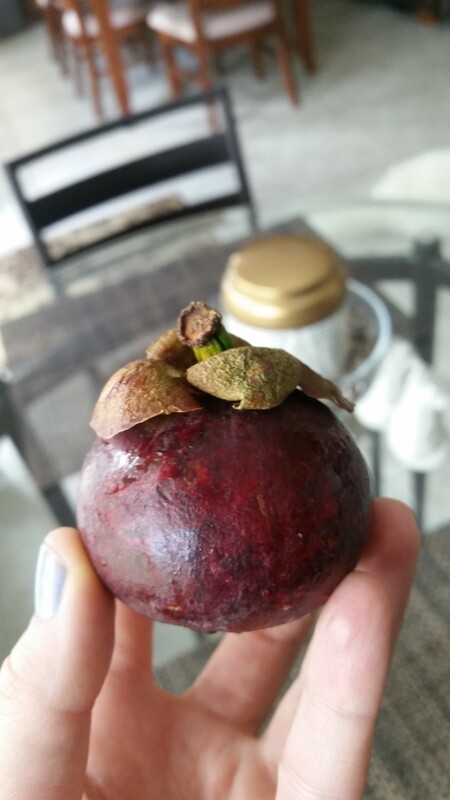 Findings of a study indicate the cardio protective effect of mangosteen on antioxidant tissue defense system and lipid peroxidation during stroke. Weight loss: Incorporating mangosteen in diet may be effective in weight loss. The various nutrients found in mangosteen also ensure good health and well-being.